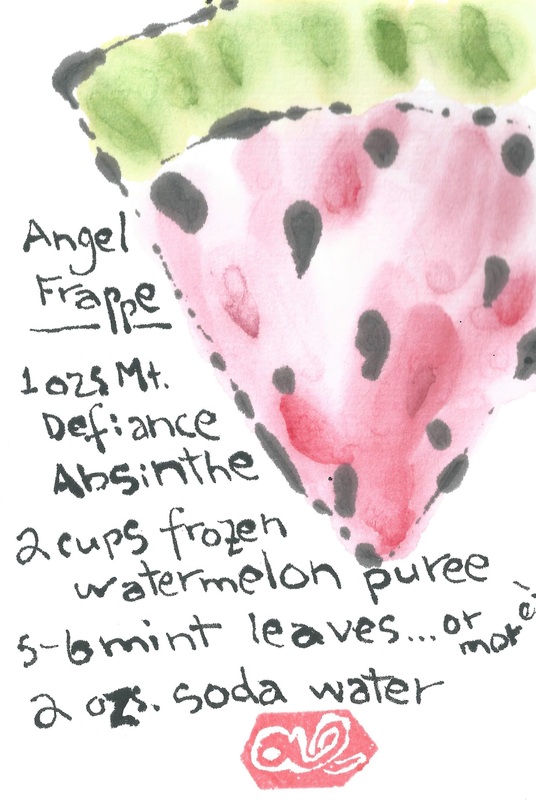 One more watermelon etegami of the year, this time featuring a cocktail recipe I worked up this summer, the Angel Frappe. It is an absinthe-based cocktail, inspired by Mt. Defiance’s Absinthe, a local liqueur made in Middleburg, Virginia. I started with the idea of an Absinthe Frappe, a drink that uses crushed ice, absinthe, and simple syrup to make a refreshing summer drink. I had been drinking a lot of fresh watermelon juice this summer and decided to try swapping it in this drink, as the sweetener. I also ditched the crushed ice, trying out frozen chunks of watermelon instead. I ended up, after some trial and error, deciding to forego the syrup altogether — the watermelon is quite sweet enough. The absinthe’s herbal bitterness (reminding me somewhat of the bitterness of blackberry seeds, oddly) rounded out the sweetness of the crushed frozen watermelon, making this a lovely drink. 5-6 mint leaves… or more! Take a quarter of a small watermelon, scoop out the fruit with a spoon or ice-cream scooper, and freeze the fruit. Add all ingredients, minus the soda water, to a blender, blend till slushy. Poor into a tall glass, add a sprig of mint and the soda water. ← How about a grape?